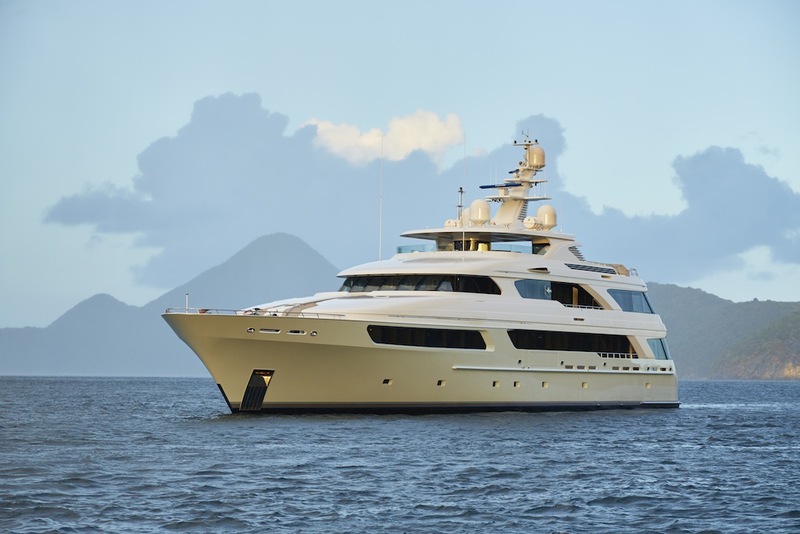 Launched in 2006, the 50m (164ft) Delta motor yacht VICTORIA DEL MAR (ex Happy Days) represents a great charter yacht, well suited for holidays with friends, family or corporate partners. 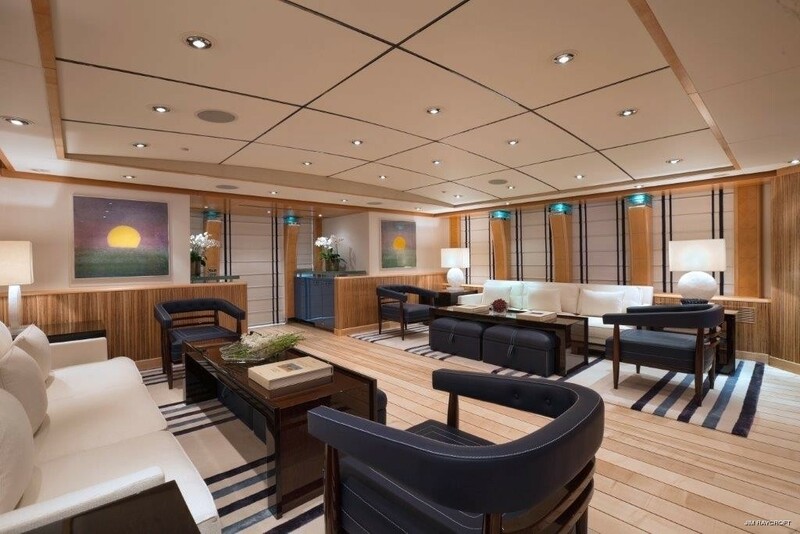 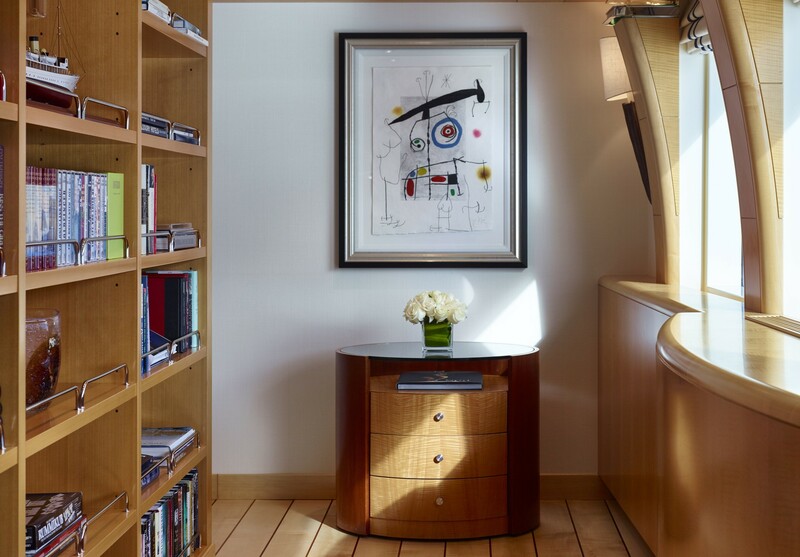 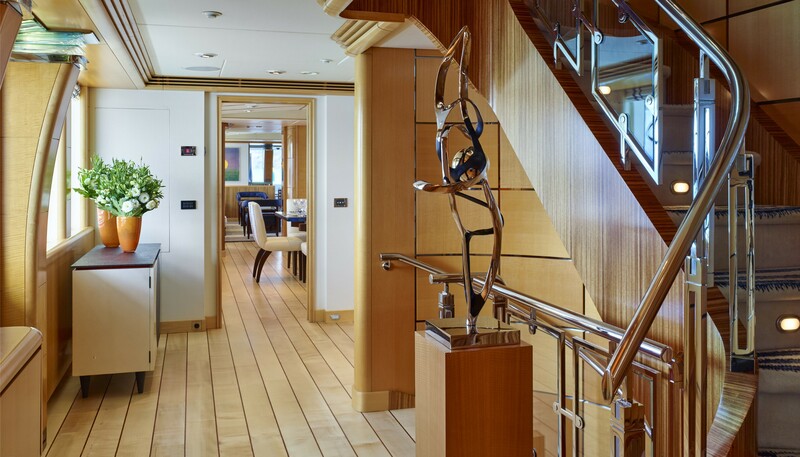 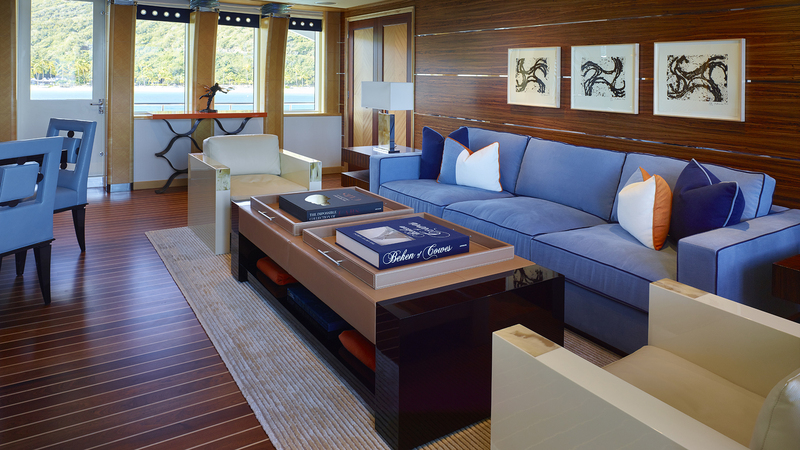 VICTORIA DEL MAR features a beautiful interior by Claudette Bonville Associates, updated during her refit in 2013. 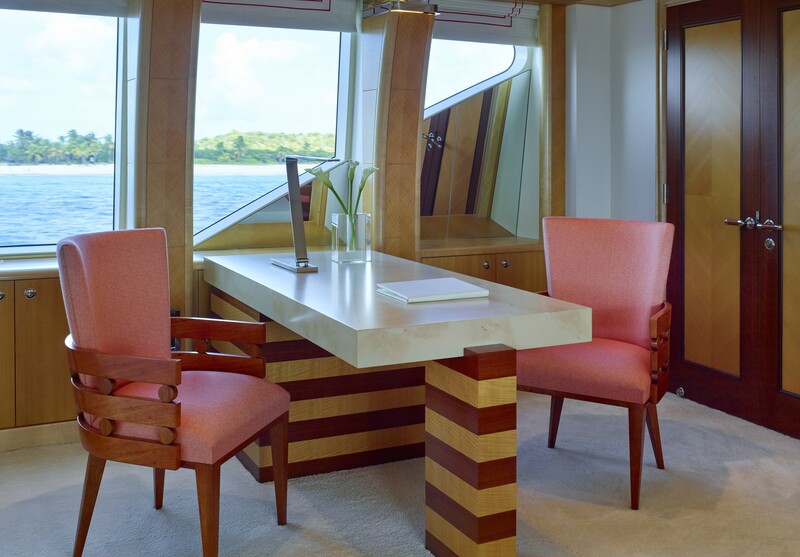 The task given to Claudette Bonville Associates was to lighten and change the overall feeling of the interior and exterior areas of VICTORIA DEL MAR, which now boasts modern, crisp and tailored design. 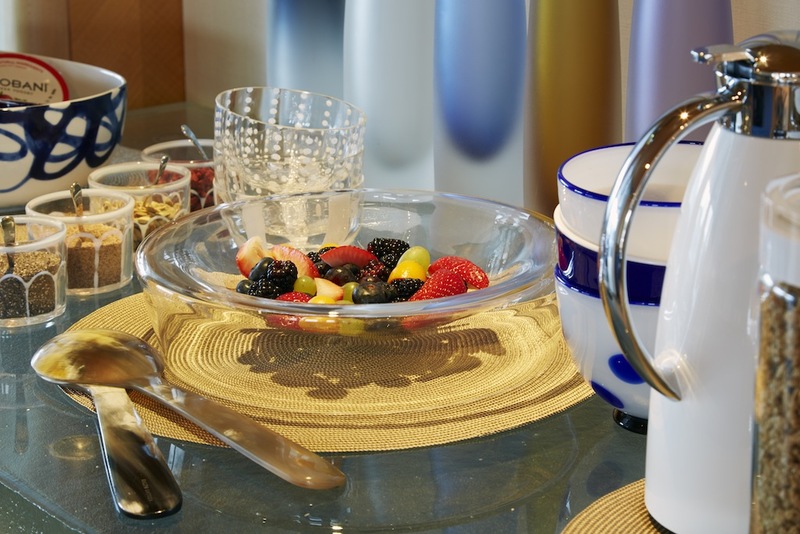 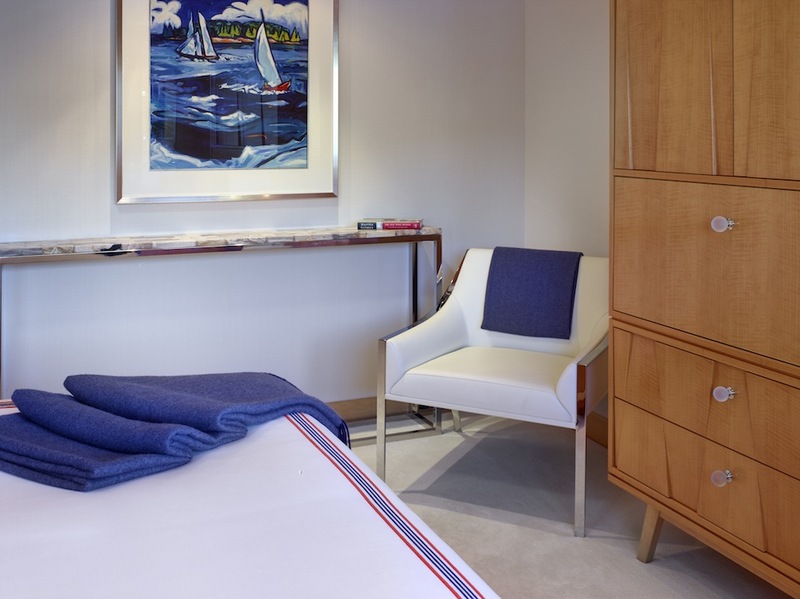 Key Alberto Pinto pieces were used to create a calm, clean-lined place to relax and unwind. 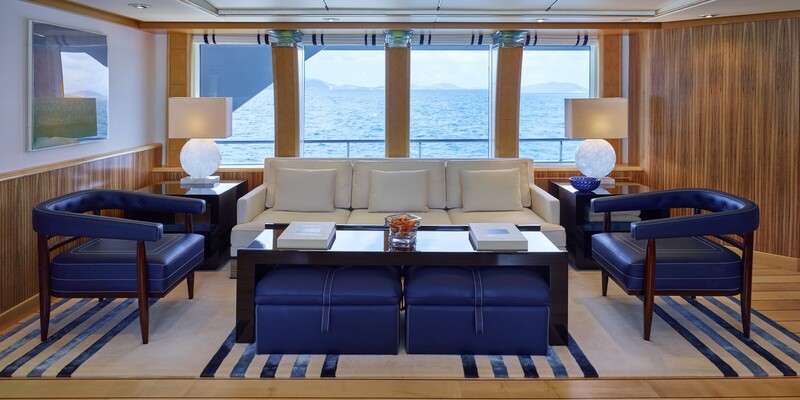 The main deck boasts comfortable leather settees and a spacious socializing area for refreshments and gatherings guests can enjoy during their charter holiday vacation aboard luxury yacht Victoria Del Mar. 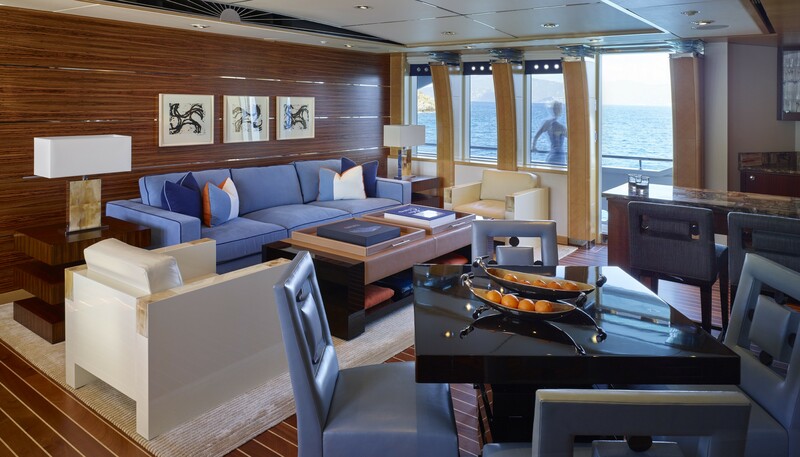 Various exotic woods, petrified wood counter tops, leather cabinets and walls contrasted with wide plank wood floors set a stylish scene for the silk striped area rugs, crisp linen fabrics, leather upholstered, postmodern furniture pieces and inviting overstuffed sofas. 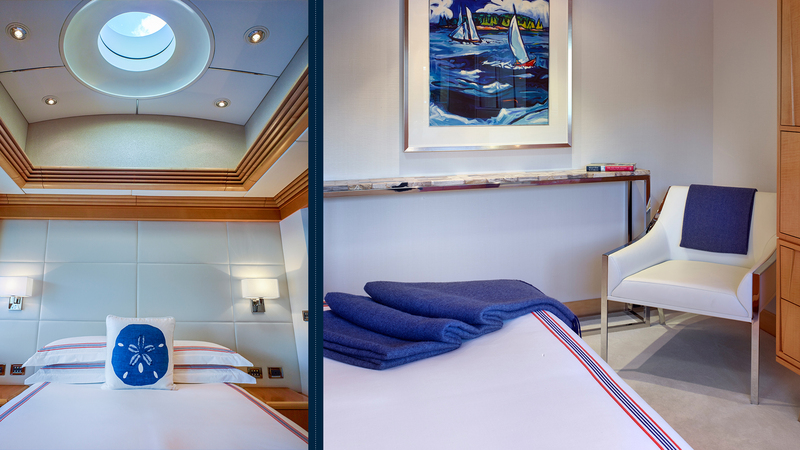 The forward VIP stateroom also carries the elegant and well-refined style, together with the rest of guest cabins on the deck below. 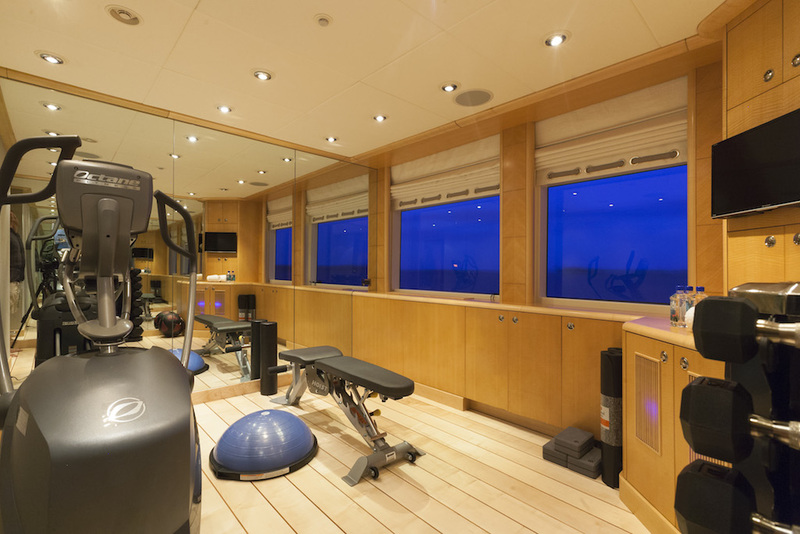 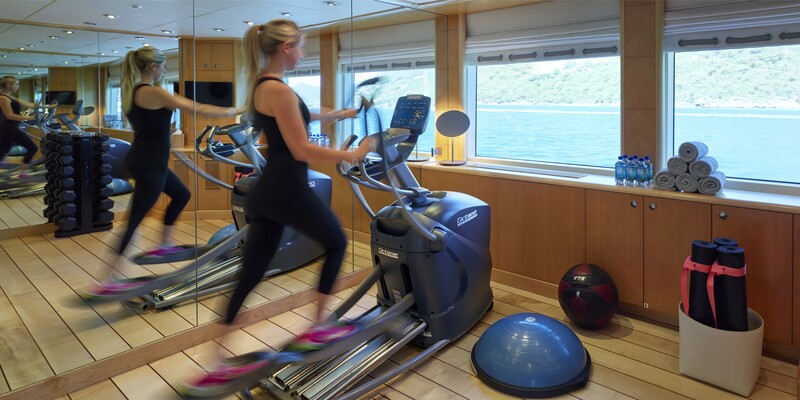 There is also a massage room and a gym waiting for charter guests, should they feel like a workout or a soothing massage. 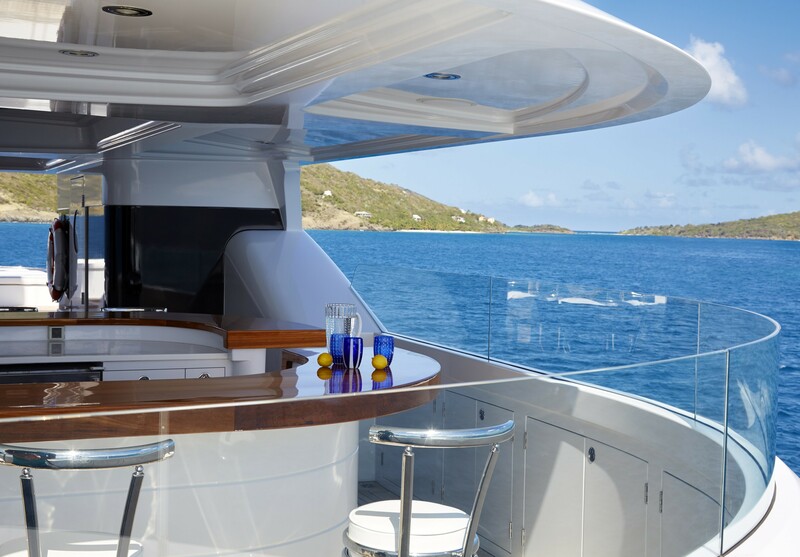 The upper deck boasts petrified wood bar tops on a counter height bar that features hidden plug-ins for the electronics. 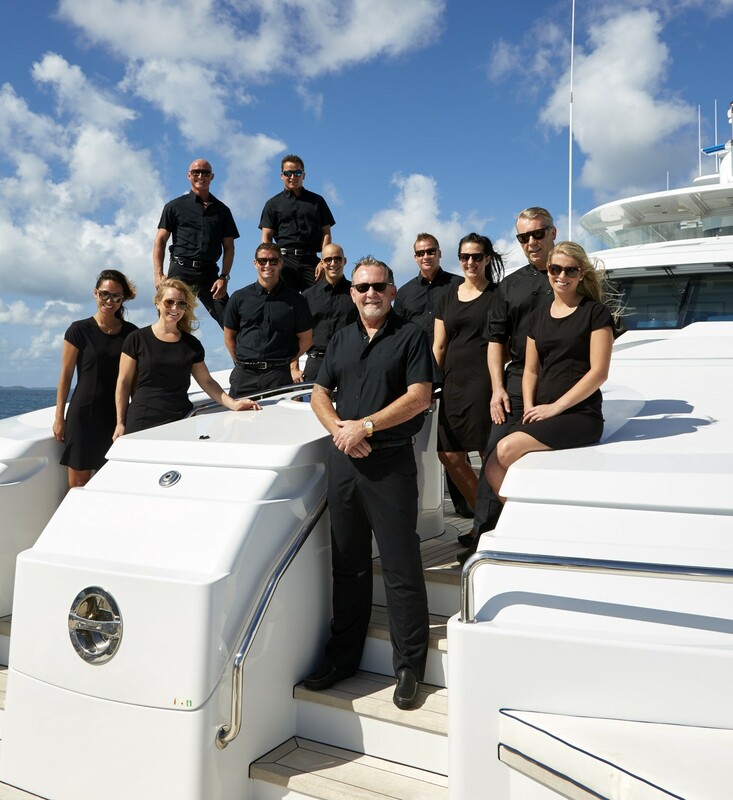 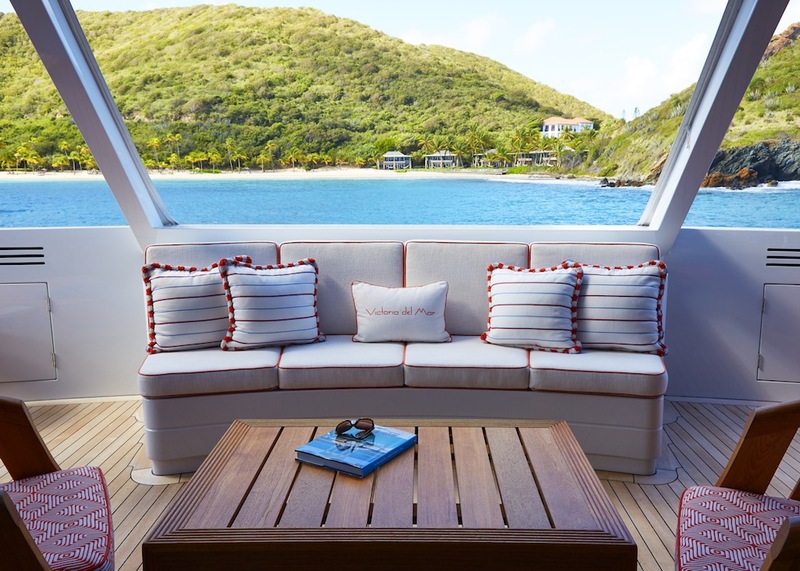 There is a comfortable sofa, polished bone-trimmed chairs from where charter guests can watch the large TV screen or simply enjoy some quality time conversing and socializing. 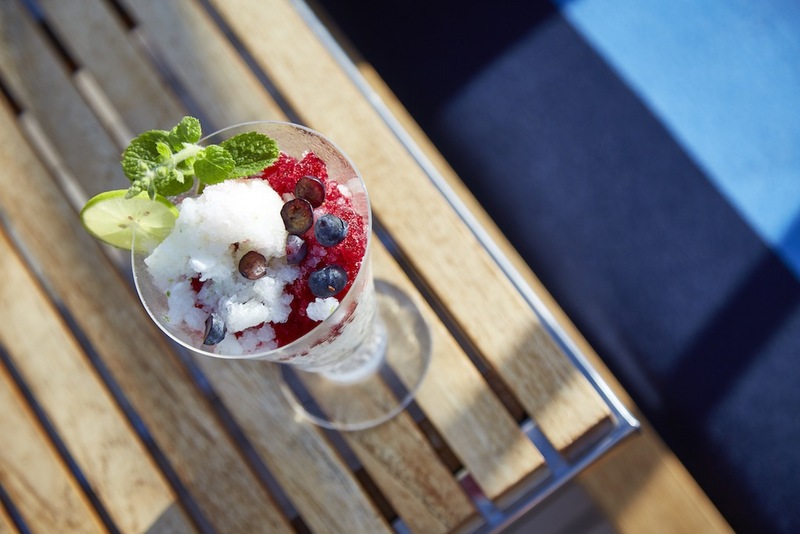 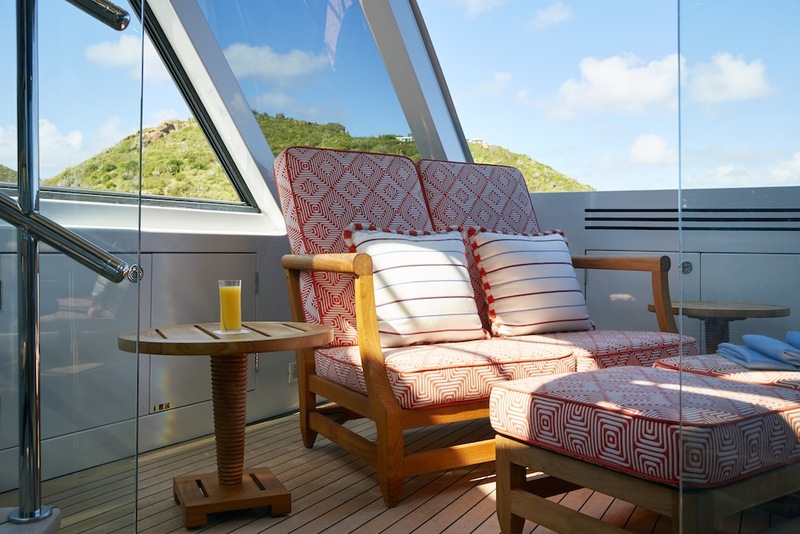 To continue the warm and opulent atmosphere, each side of the sky lounge features hidden treasures in the surprising balconies and seating nooks where guests can find privacy watching the horizon or read a good book. 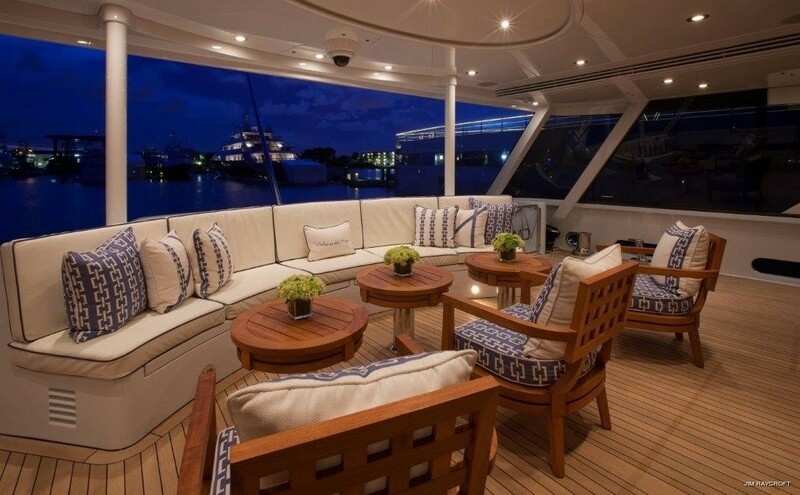 Victoria Del Mar has a spacious sun deck, which cannot be found on other vessels of this size. 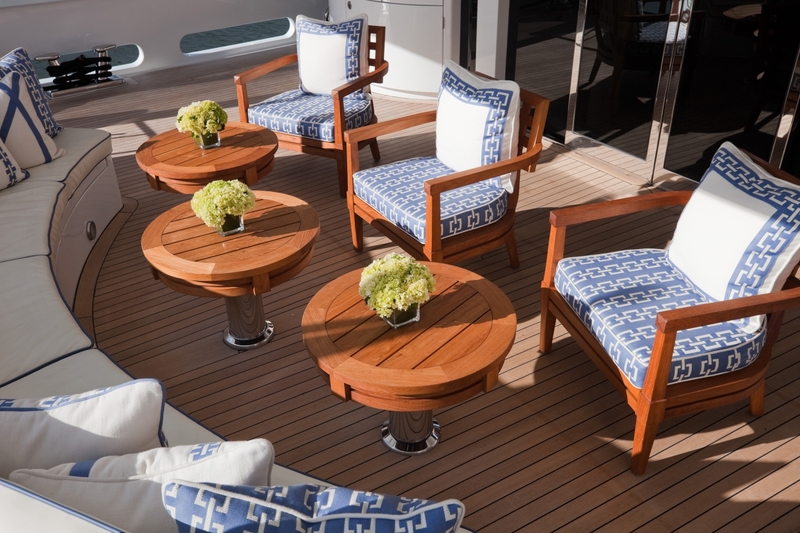 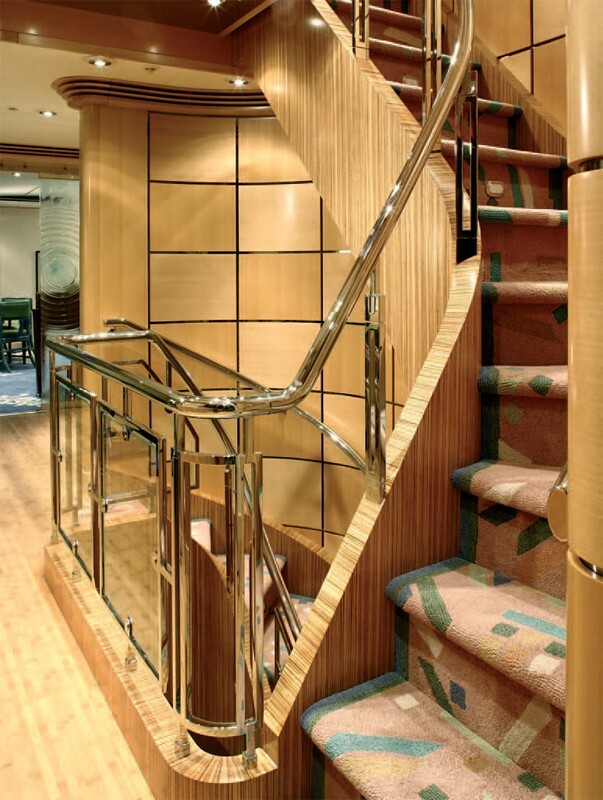 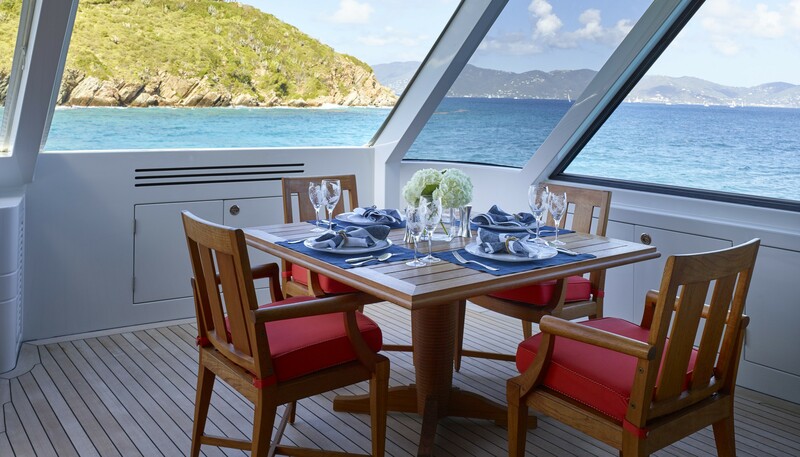 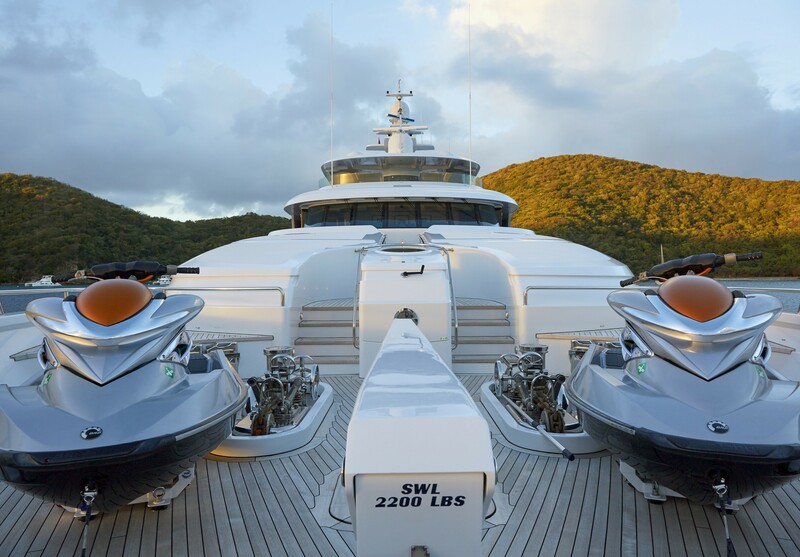 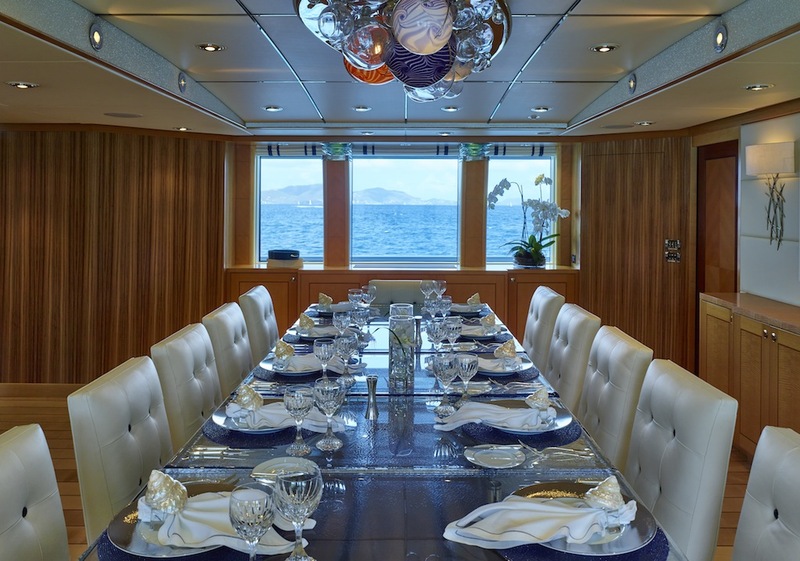 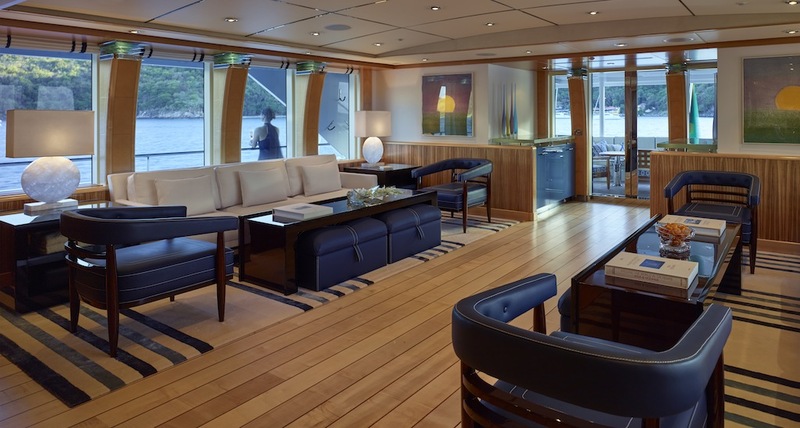 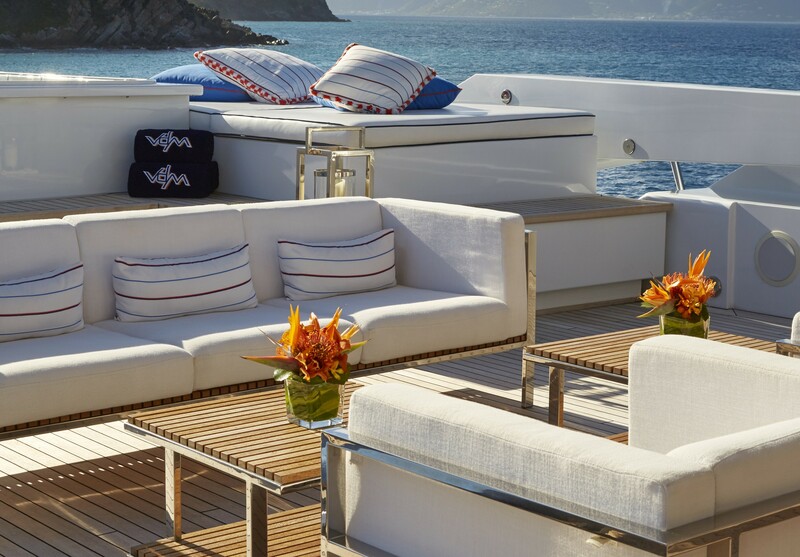 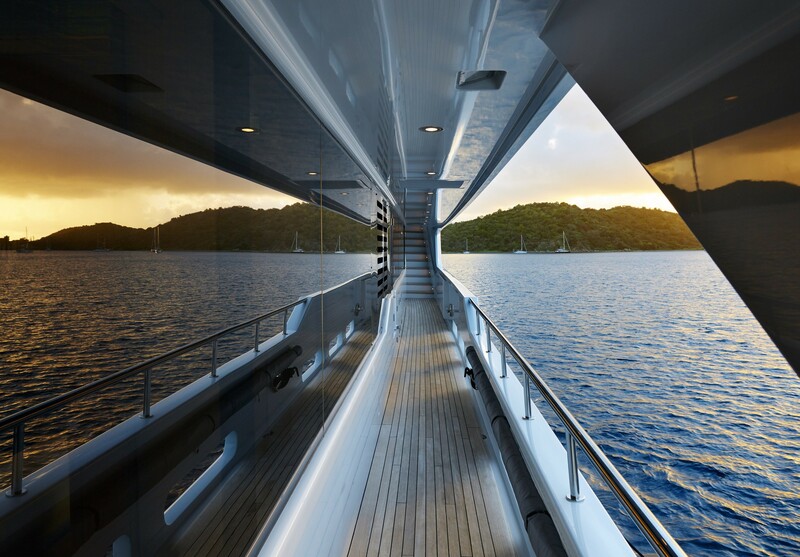 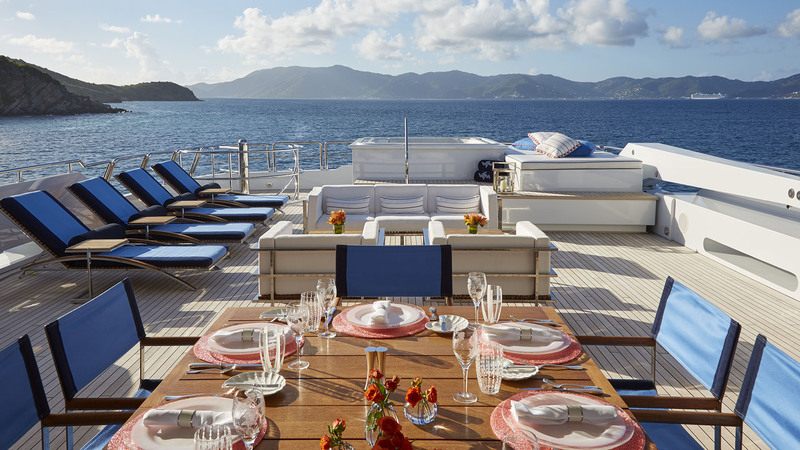 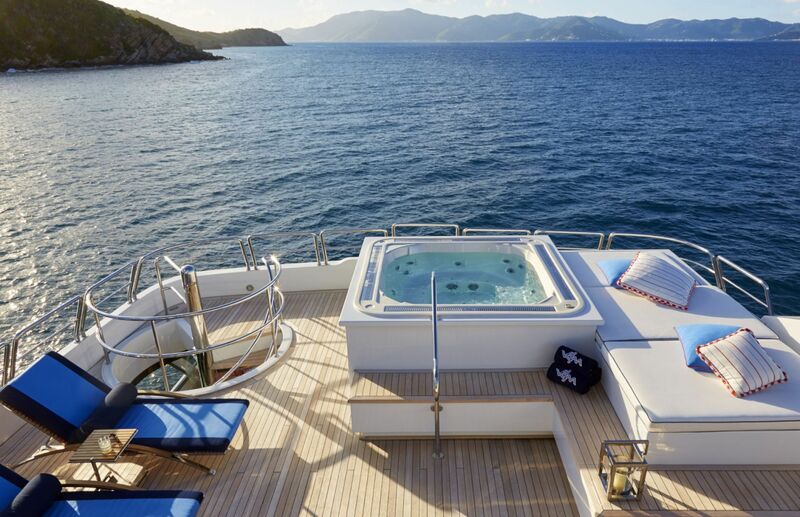 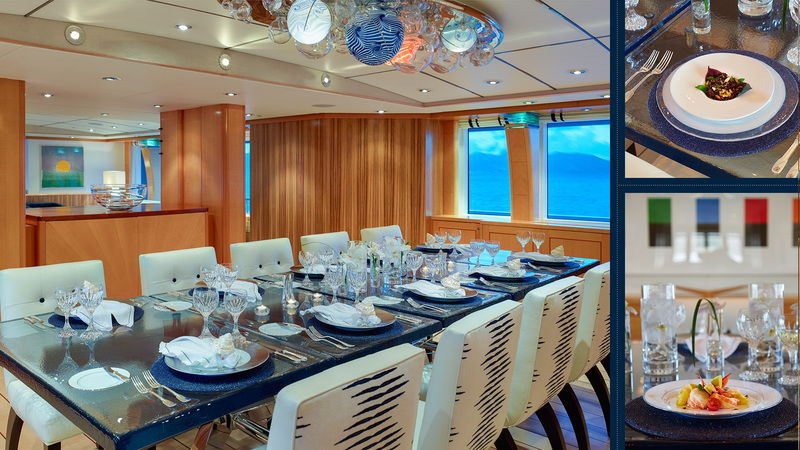 Beautiful stainless steel and teak furniture upholstered in the finest fabrics were chosen to enhance the deck. 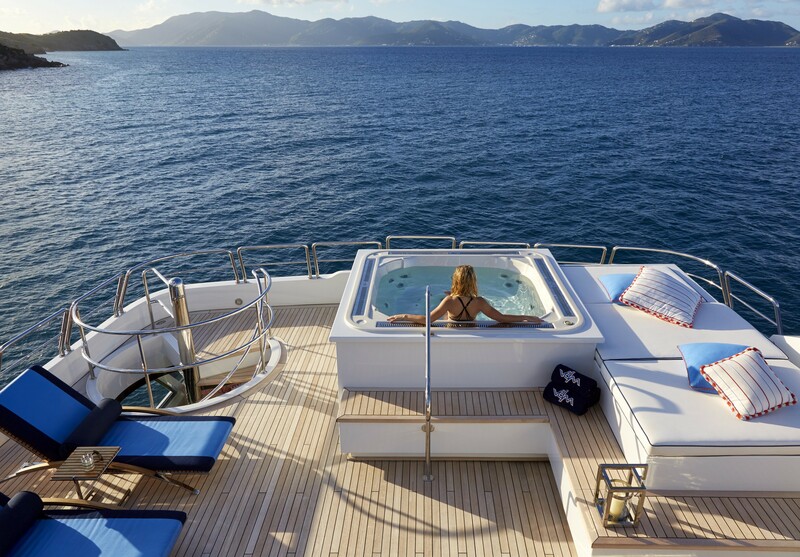 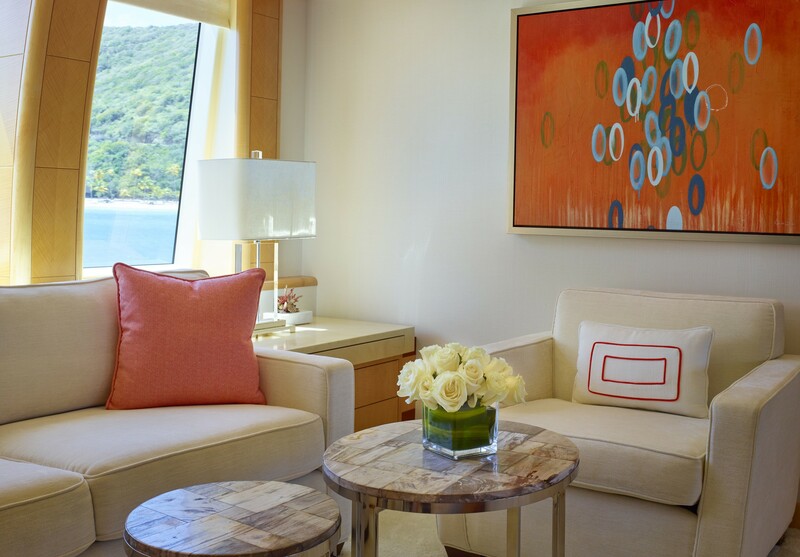 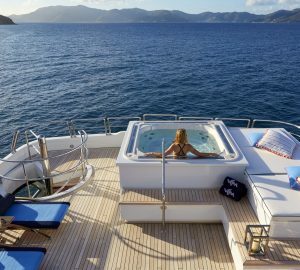 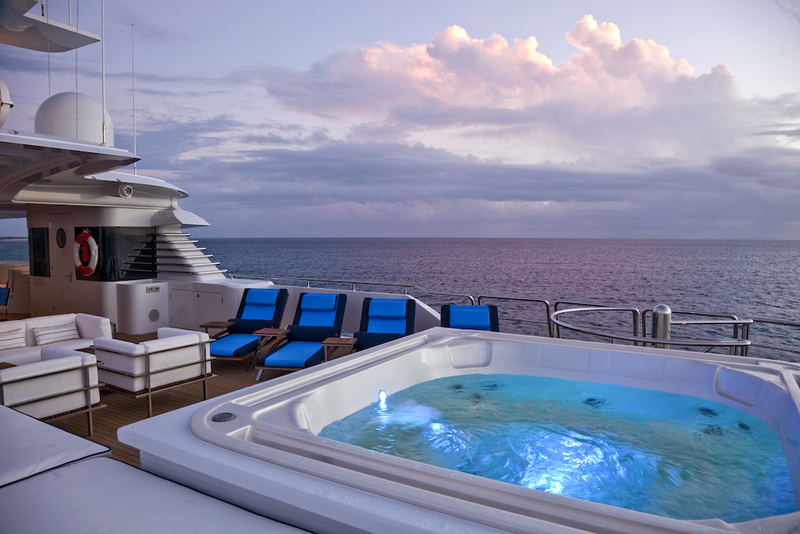 Charter guests can enjoy the sun or conversation on a built-in sun pad, chaise lounges or the Zen-like hot tub where they can gaze out over the water and converse with friends while tanning and relaxing. 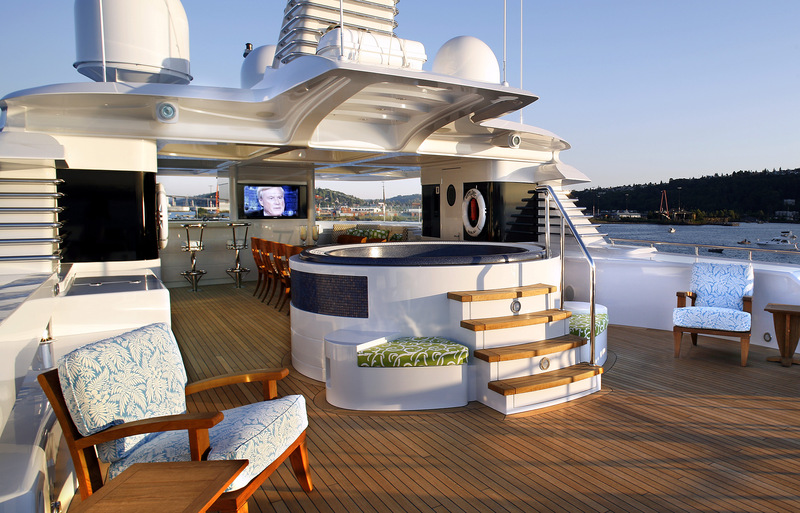 There is also the vast seating area, with a large, circular bar and built-in settee. 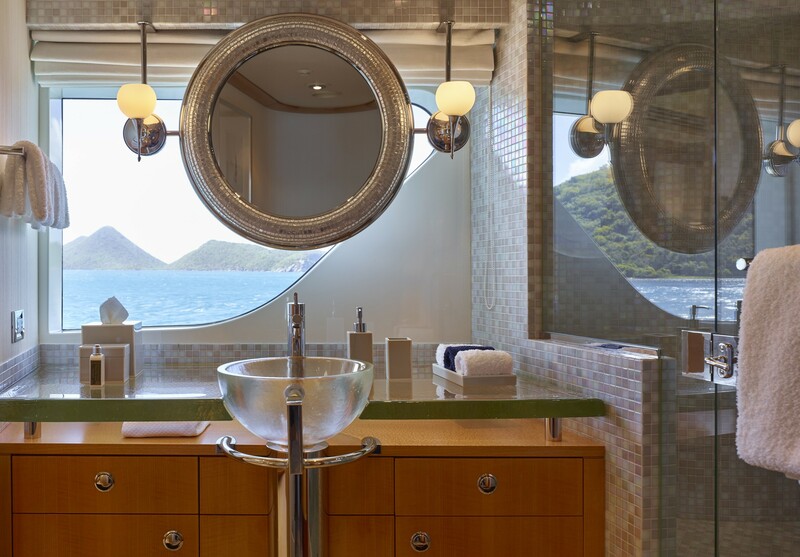 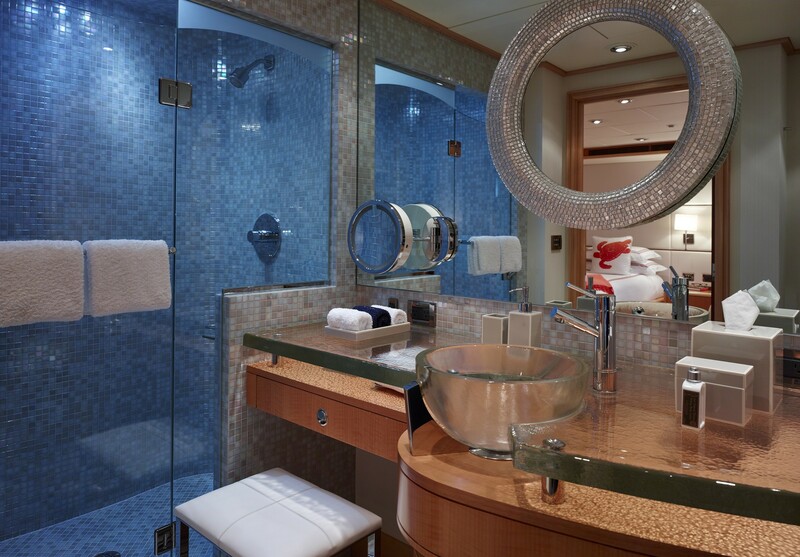 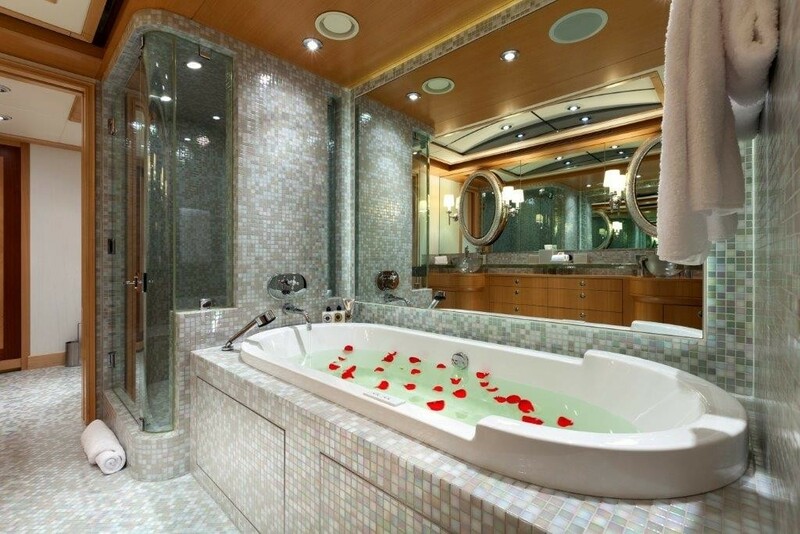 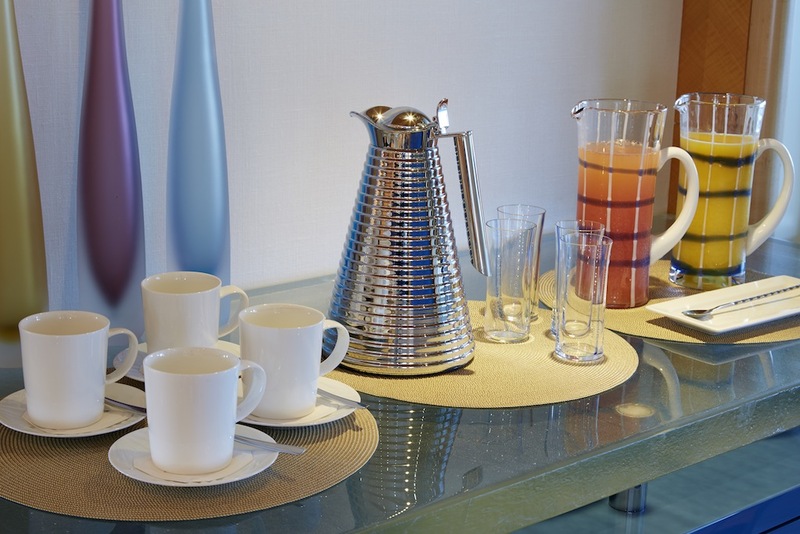 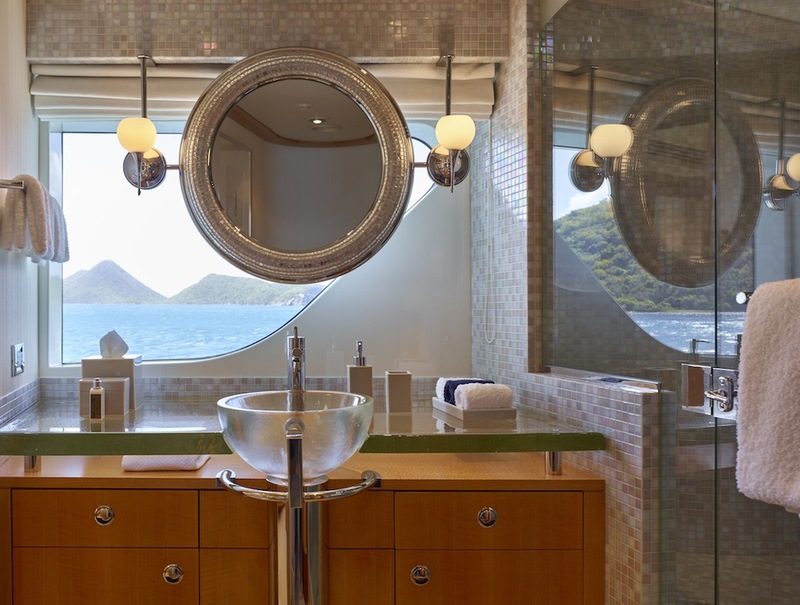 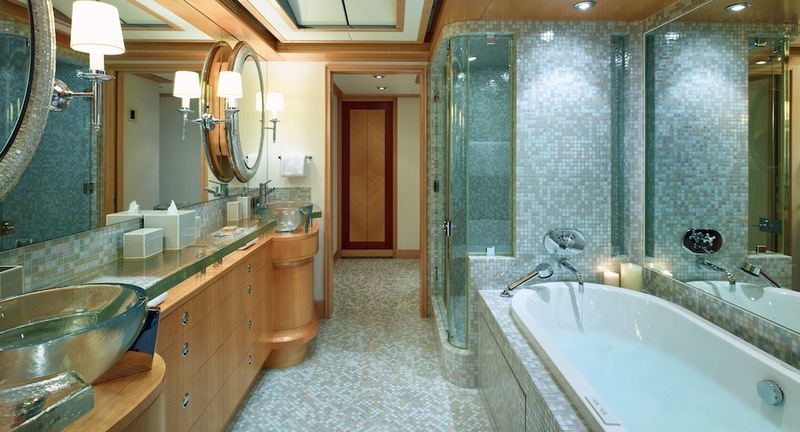 A private, air-conditioned day head, complete with shower, is conveniently situated on the sun deck. 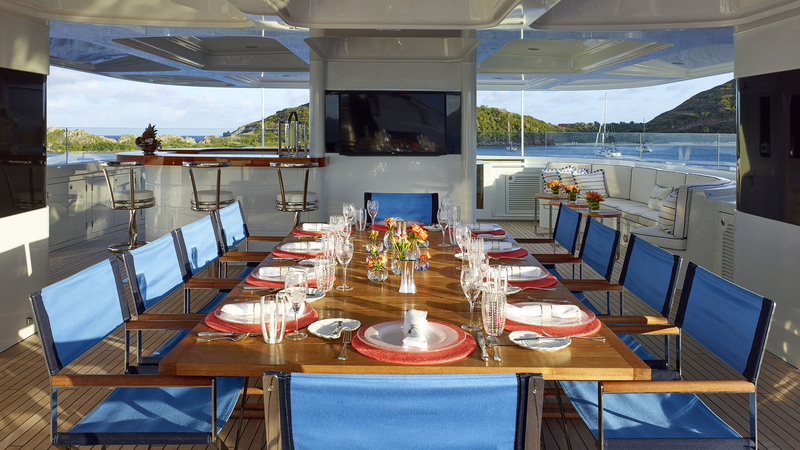 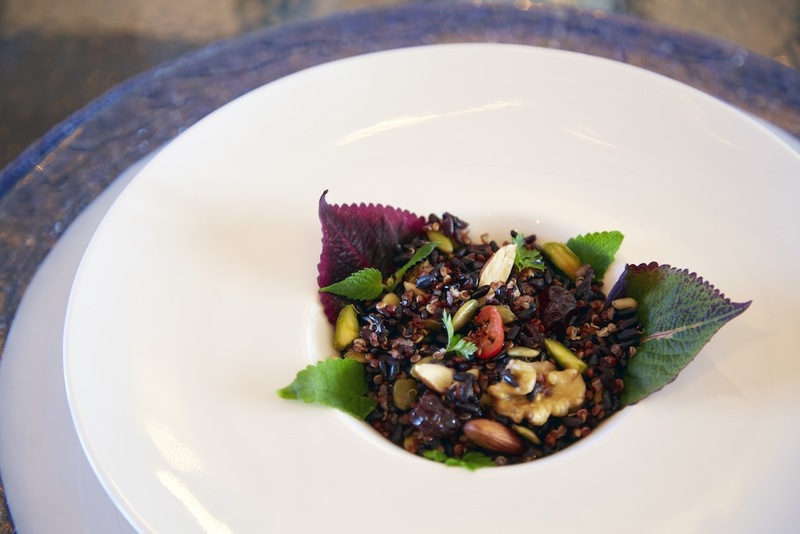 What makes this space so interesting, is the possibility to seat 18 guests comfortably for dinner al fresco. 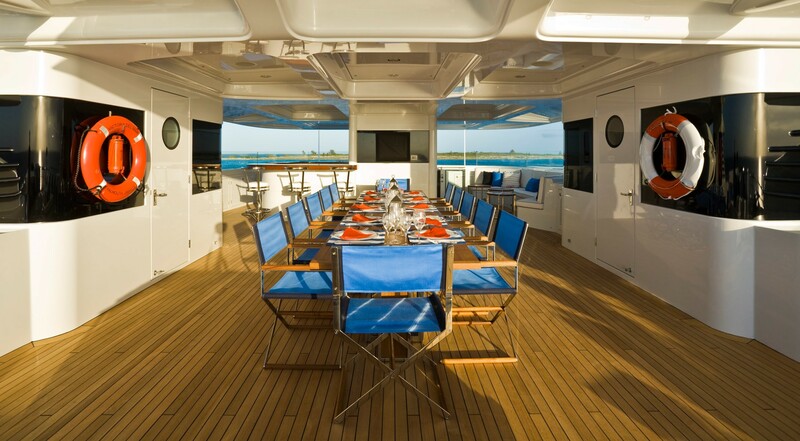 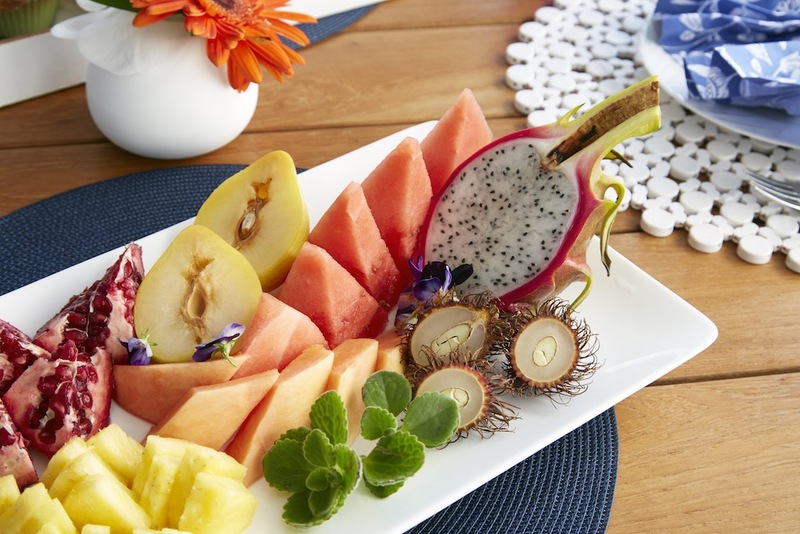 The table for 12 splits apart to accommodate 18 easily. 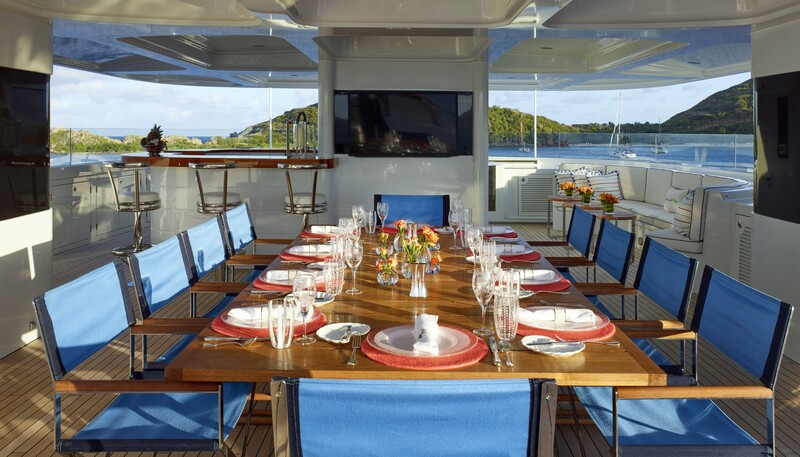 Following the dinner, guests can get comfortable under the stars to watch movies on a large, double-sided screen which can be viewed from any part of this impressive deck. 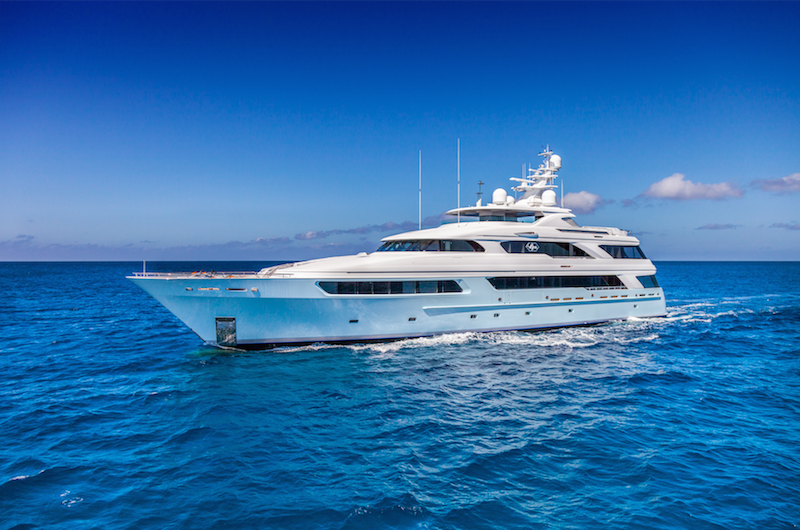 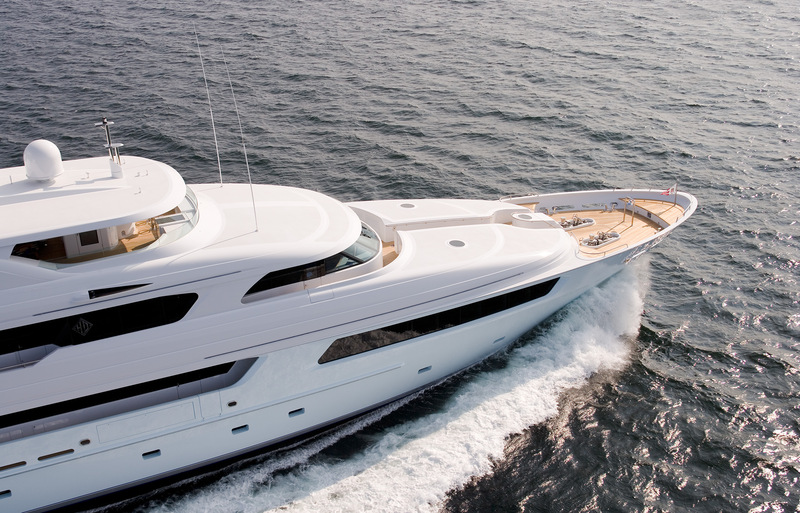 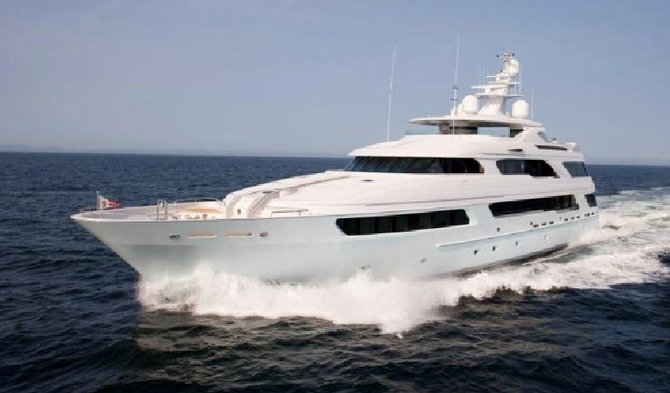 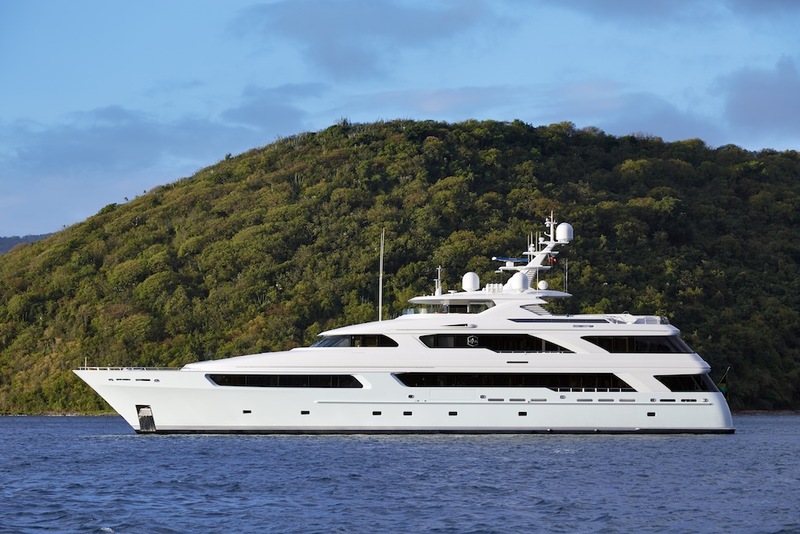 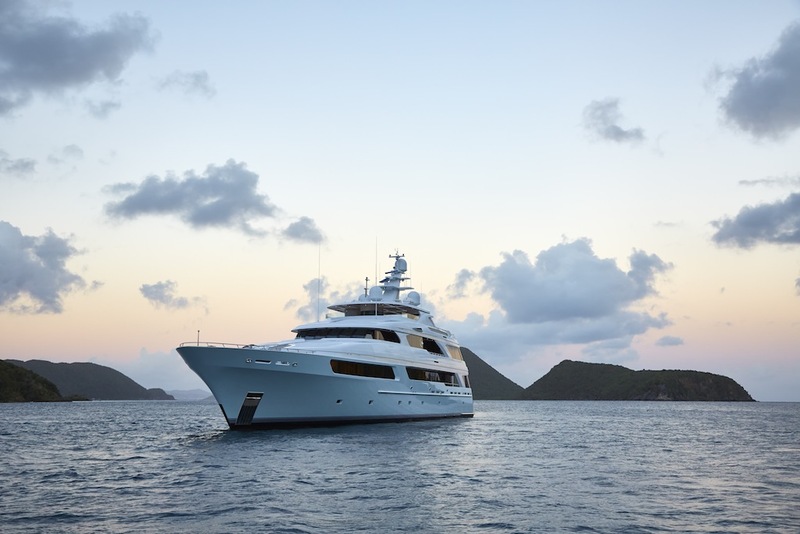 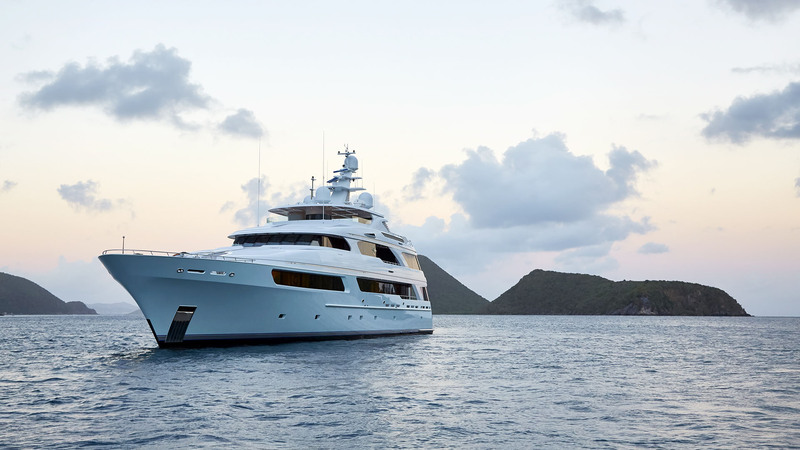 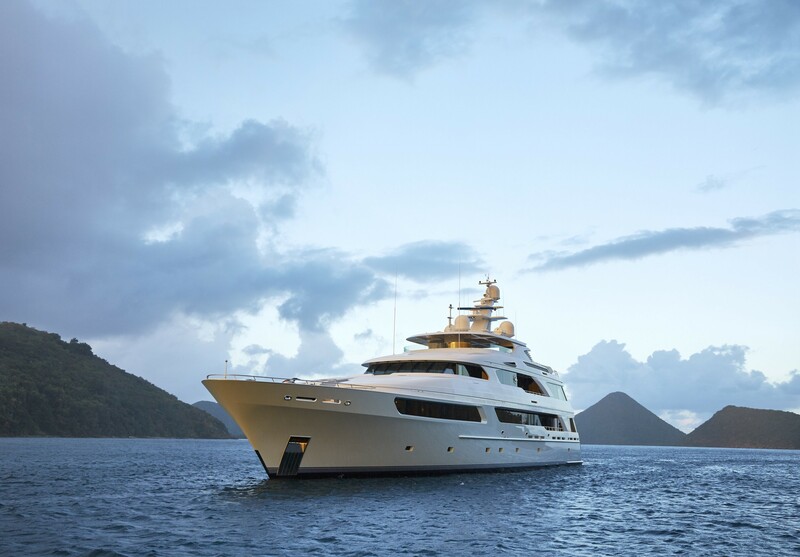 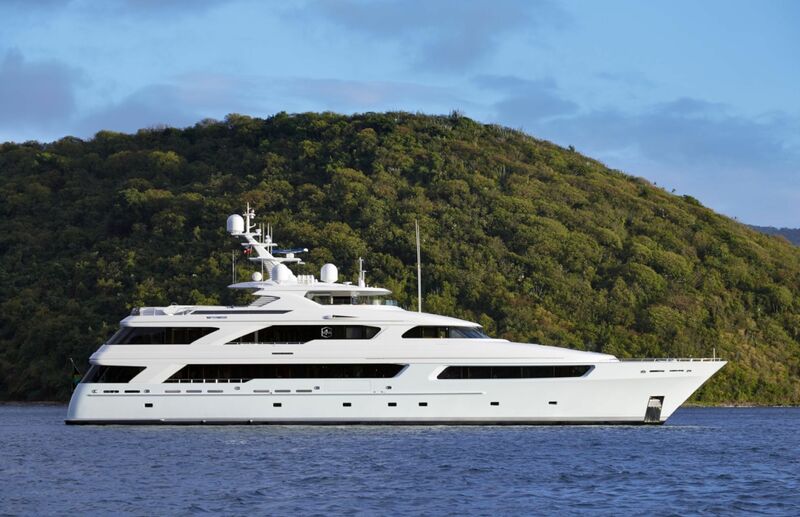 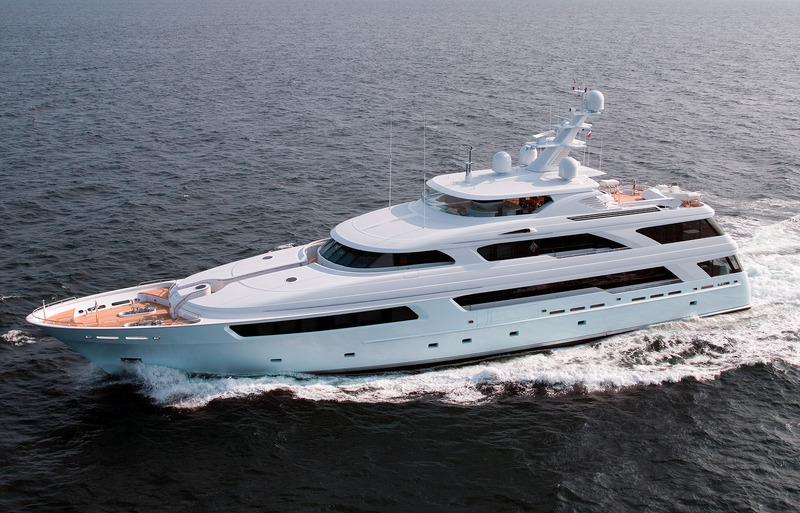 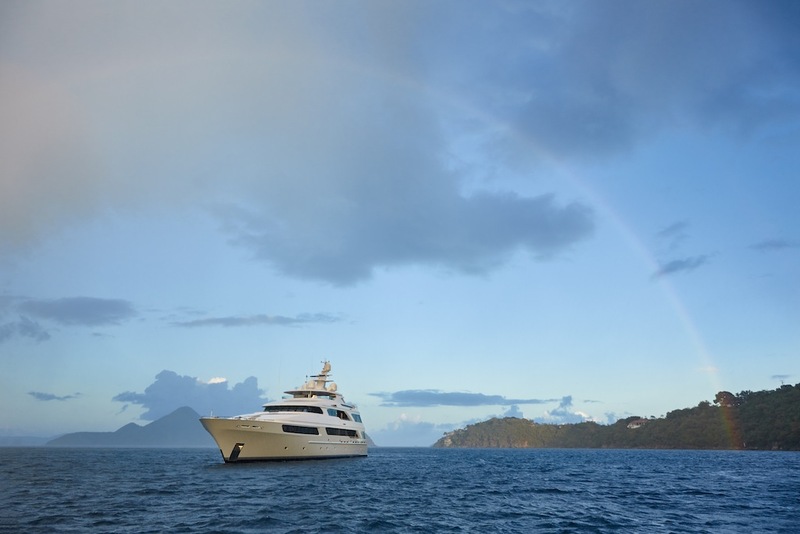 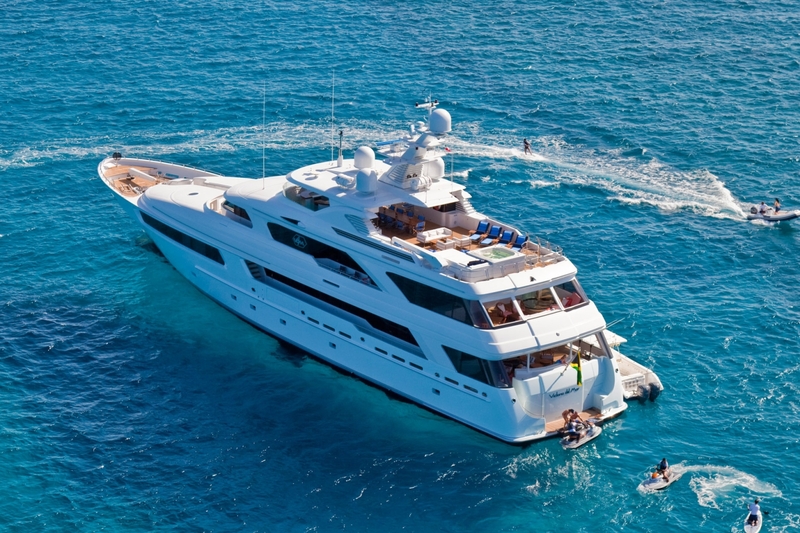 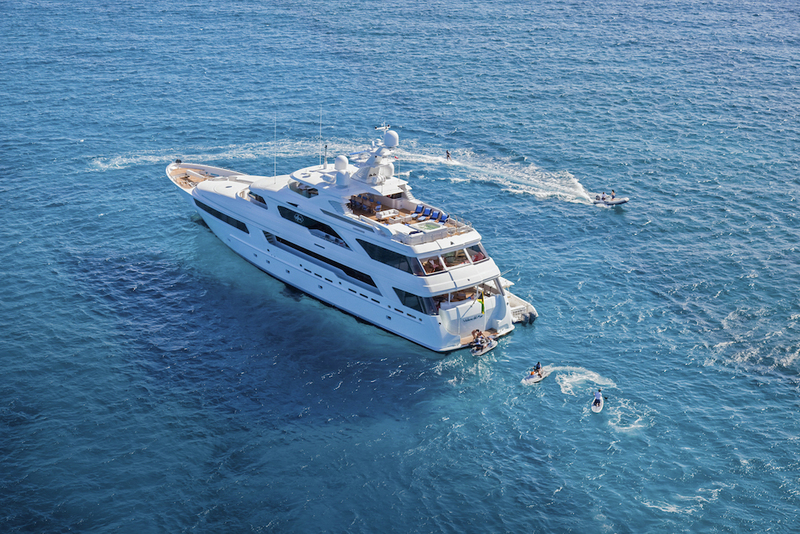 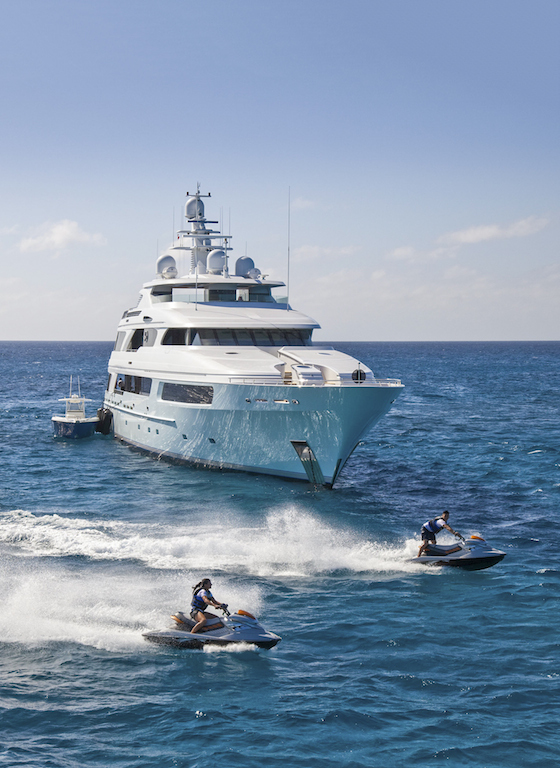 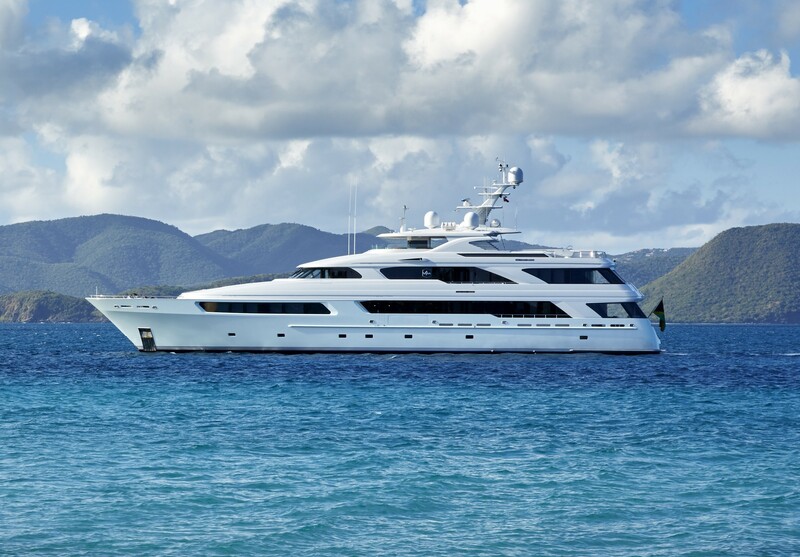 VICTORIA DEL MAR is able to accommodate up to 12 charter guests in 7 guest cabins including a master cabin on the upper deck, 2 VIP cabins forward on the main deck, plus 2 double cabins and 2 twin cabins on the lower deck. 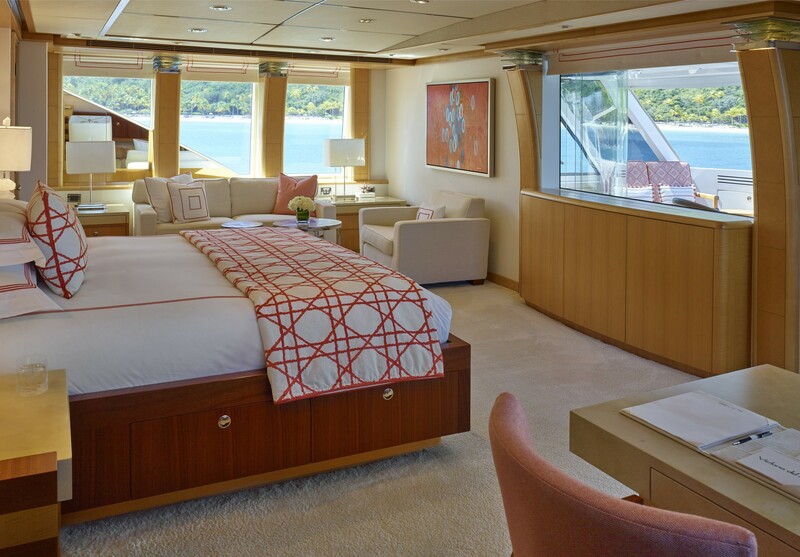 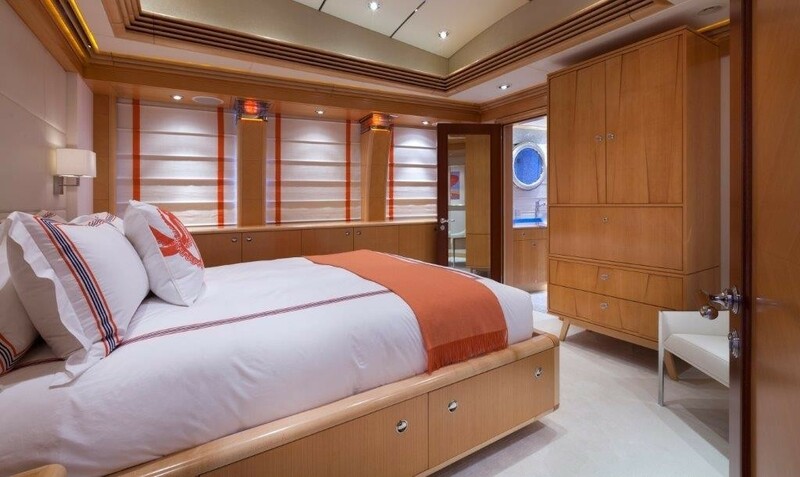 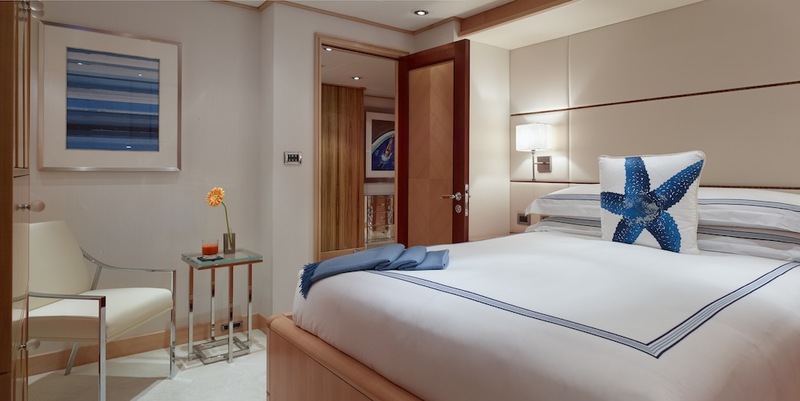 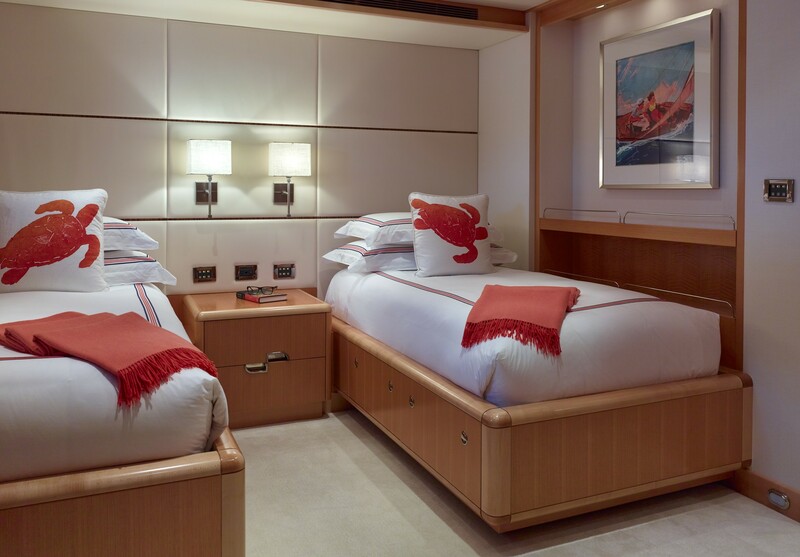 The private master stateroom is located aft, accessible through double doors. 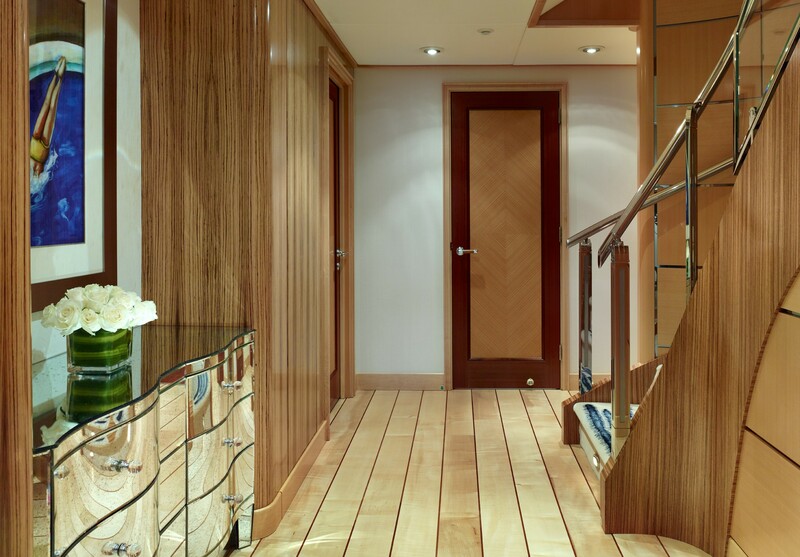 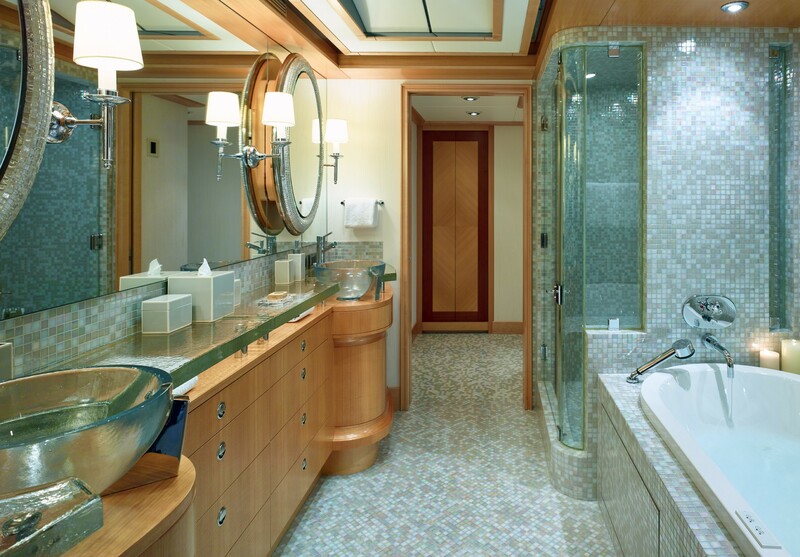 The suite boats a large dressing area, as well as closets, cabinets, a large en suite bathroom with a large jetted tub, a shower and a private toilet room. 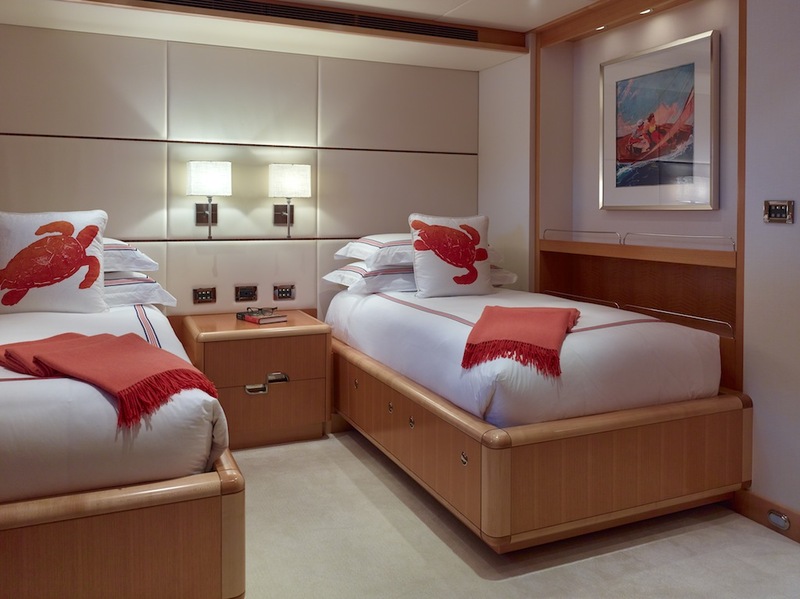 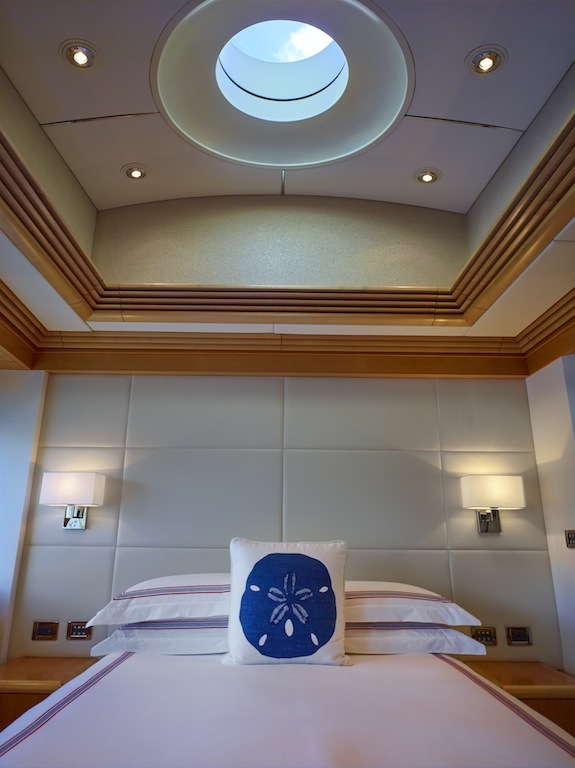 The stateroom also features luxurious linens, sumptuous silk carpets, and leather clad walls. 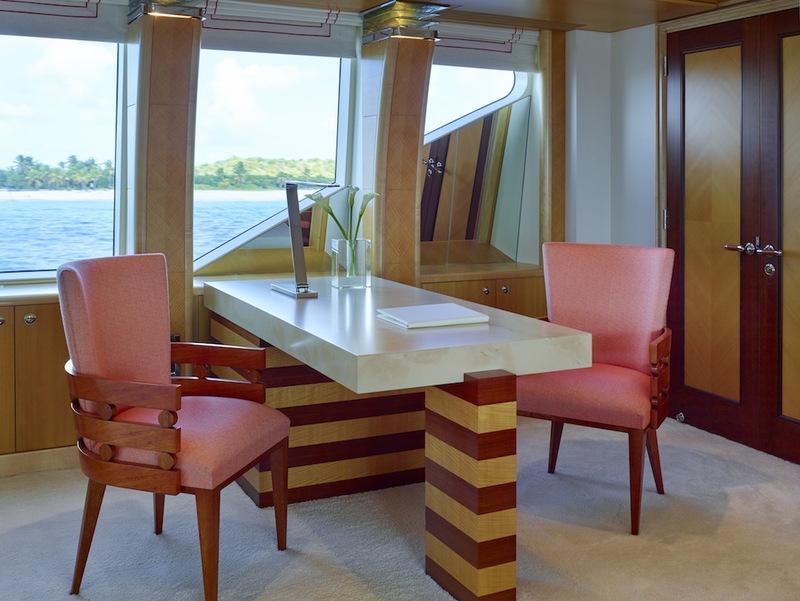 There are a private seating area and a desk for two on the opposite side of the cabin. 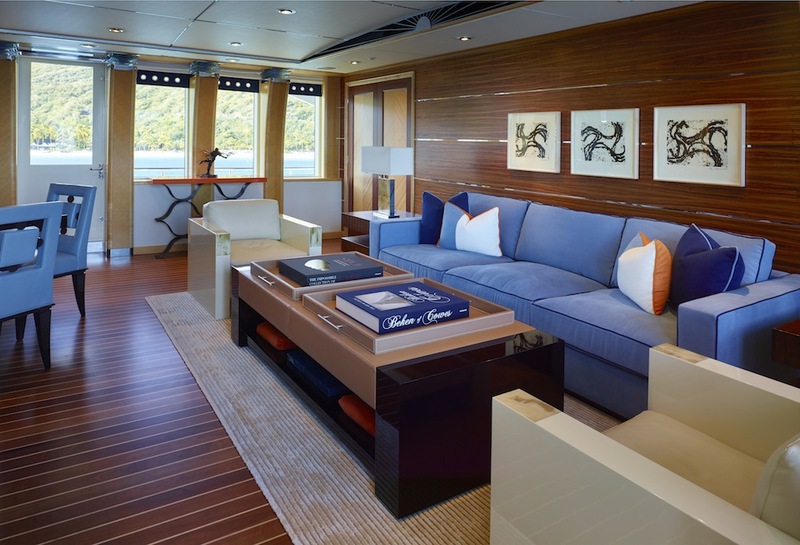 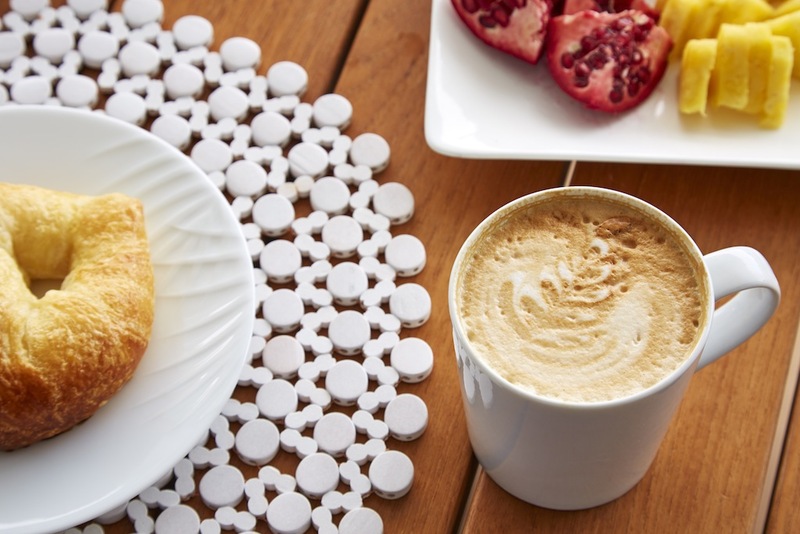 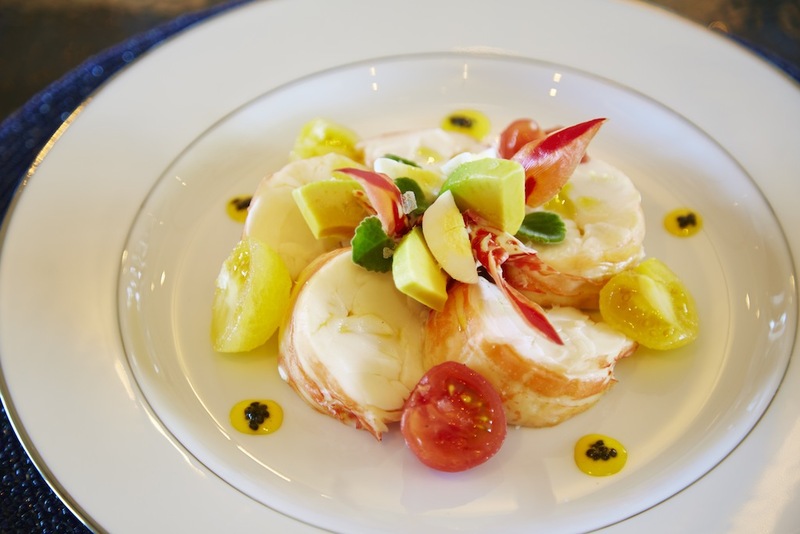 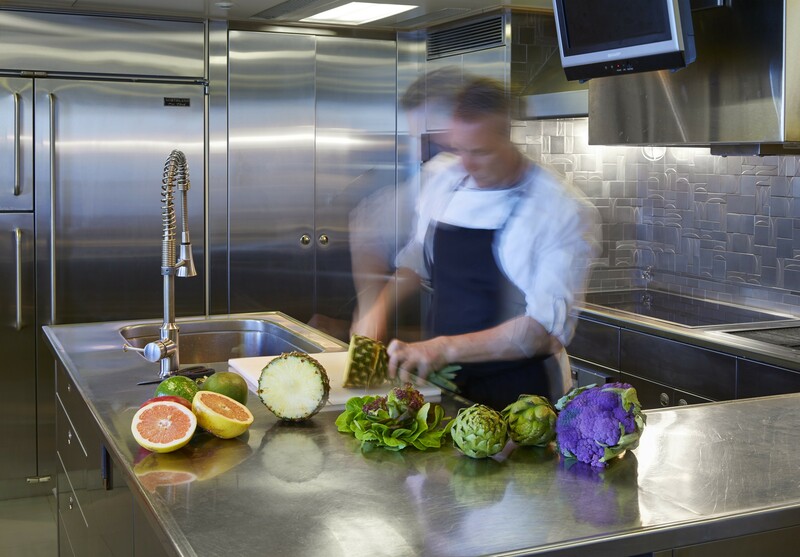 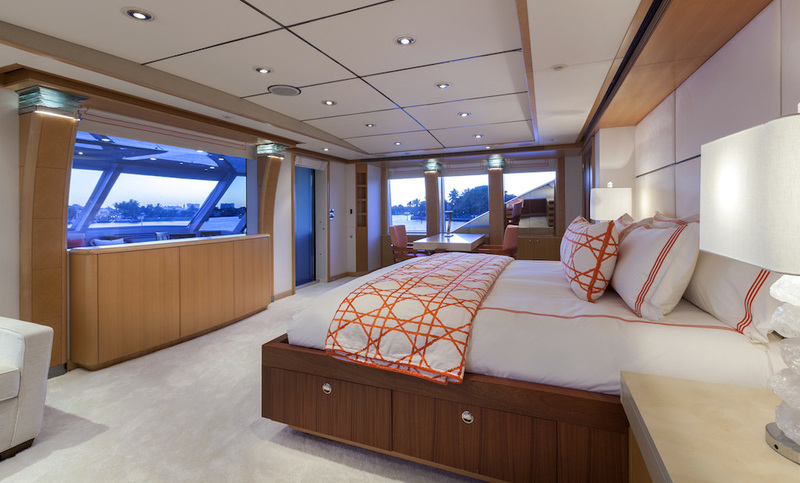 One of the main features of the master cabin is that it is very private and isolated, with a full beam aft deck where guests staying in the master cabin can entertain up to 6 guests for dinner or refreshments. 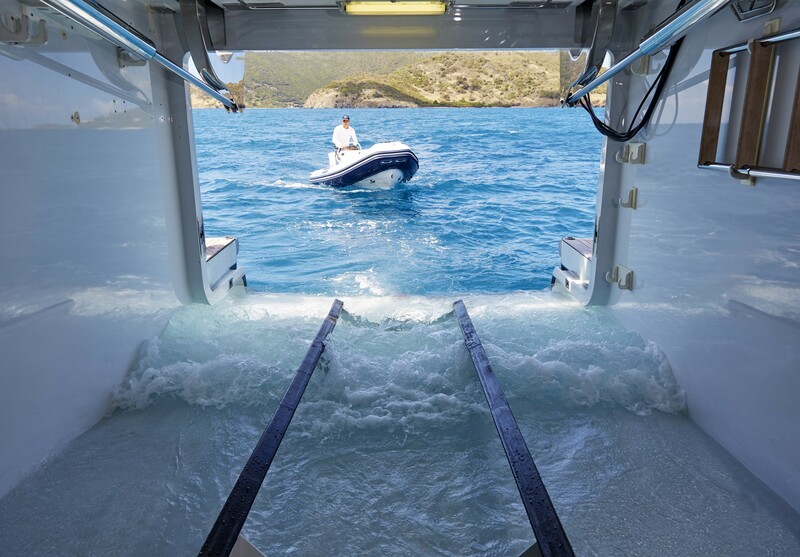 Tenders & Toys include a 32ft Century tender, 22ft Nautica RIB Jet 22 Limited, 2 SEADOO RXP-X Waverunners, 2 Sea Bobs, DJI Phantom 2 Vision GPS Drone, an Inflatable Banana, an Inflatable Trampoline, 2 Inflatable Tubes, 2 Inflatable Kayaks with 4x Paddles, 2 Inflatable Paddle Boards with 2 Paddles, 2 Pair water skis, a Wake board, a Tow rope, RYA Personal Water Craft Certified training with 6 instructors Elliptical Machine, Bench Press, Free Weights, Yoga Mats, Blocks, Straps, Bosu balls and Resistance Bands. 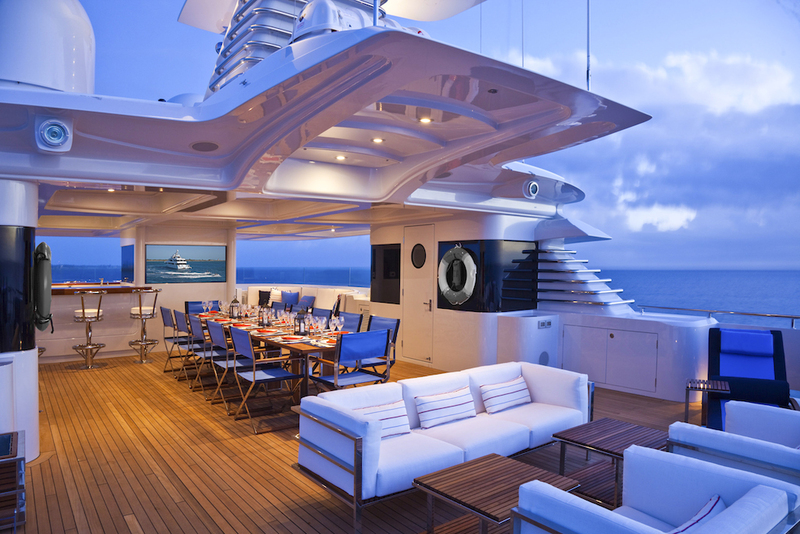 Audio Visual Equipment and Deck Facilities include: Kaleidescape Blu Ray system controlled by iPad minis. 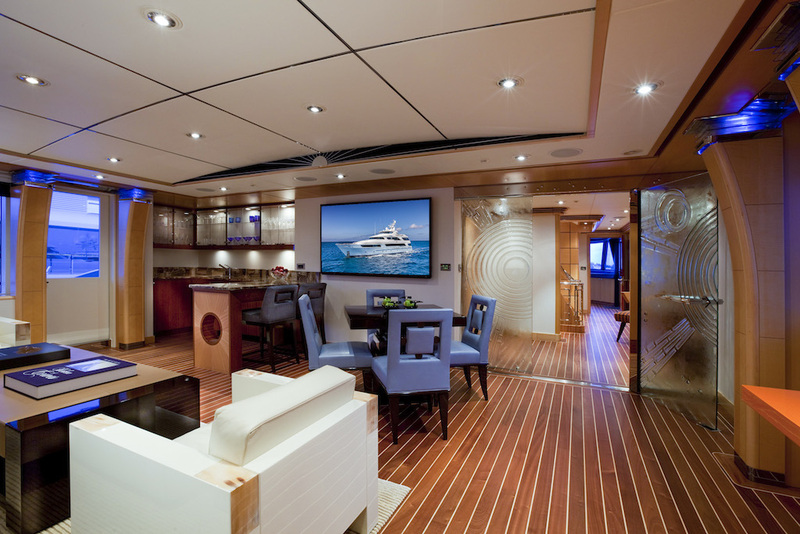 HDTV's throughout. 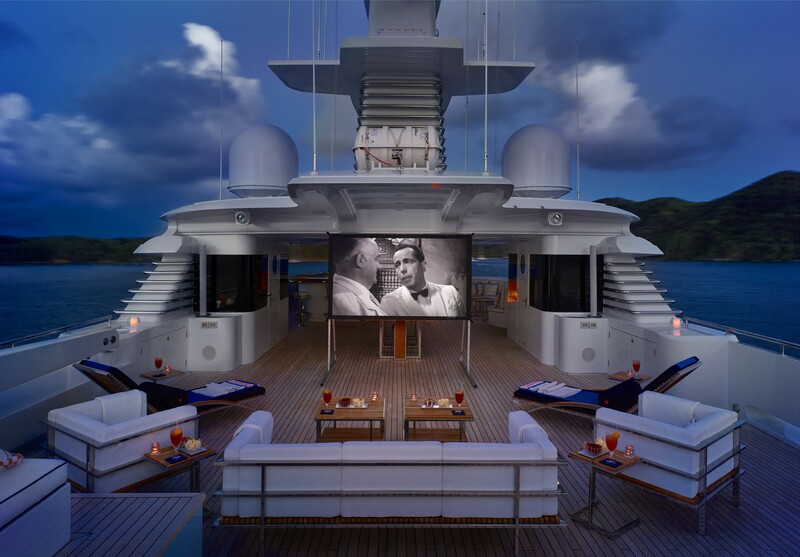 HD projector and 100" screen on the Sundeck. 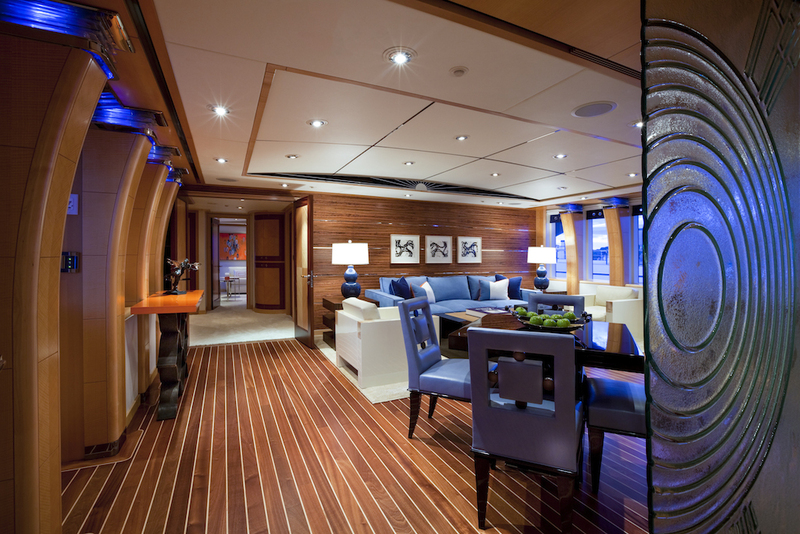 HDMI inputs in VIP cabins and guest cabins for game inputs. 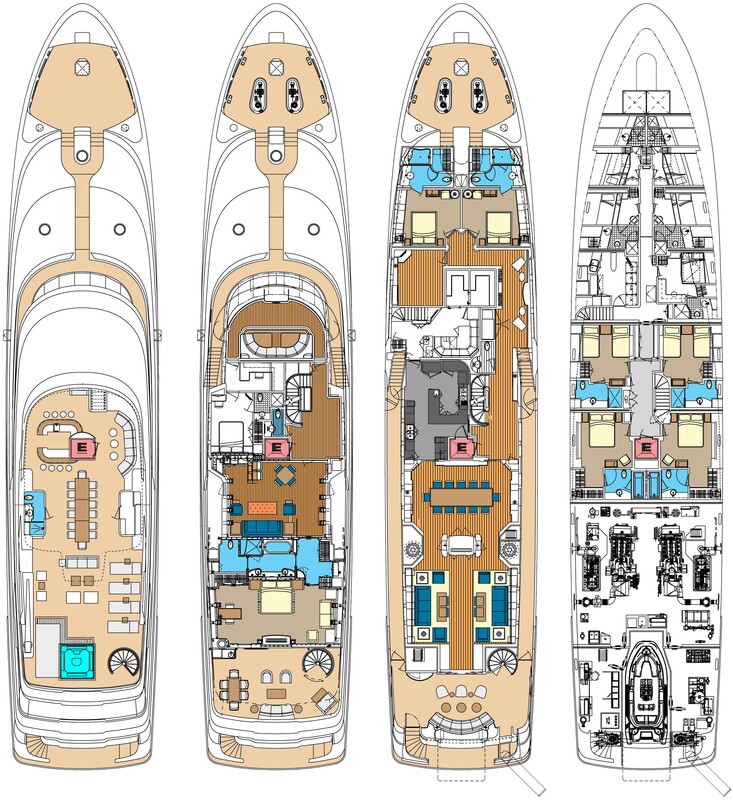 Hard wired audio inputs in all locations for music sources to connect to.